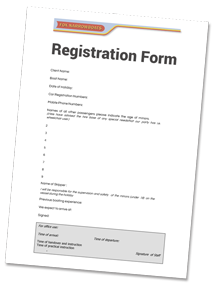 b) Download the attached pdf form print out and bring with you on the start day of your boat hire. Add at least 1 mobile phone number which will be used on board the boat during hire. It's useful to have multiple numbers. If you are bringing a pet, please list the pet type. And if the pet is a dog (up to 2 allowed), note the breed. The name of the skipper or party leader (must be over 18 years of age). He/she will be responsible for the supervision and safety of the minors (under 18) on the boat during the holiday. I/We have advised the hire base of any special needs that our party has i.e. wheelchair user.